X-Games Aspen 2017 Woman’s Ski Slopestyle has just wrapped up and Kelly Sildaru just took the gold once again. Kelly put down an amazing rail run plus some serious rotations on the jumps. The surprise of the day was definitely Tess Ledeux. The young french put down a sick 1st run with one of the biggest rodeo 7’s you have ever seen by a girl, landing her in 2nd place. 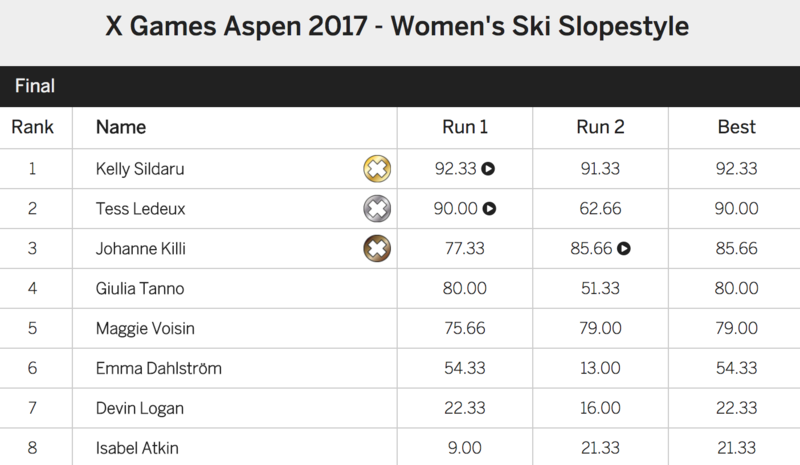 Johanne Killi rounds out the podium with a solid run followed by Swiss skier Giulia Tanno. Here are the full results and you can watch the full replay plus Kelly’s amazing winning run!